The new Rokinon 35mm Cine Lens is made especially for DSLR video enthusiasts, videographers and cinematographers. It features the same outstanding image quality as the standard Rokinon 35mm F1.4 lens but has the added benefits of de-clicked apertures and follow focus compatibility. De-clicked apertures means that there are no hard clicks when changing apertures and the aperture can be manually set to a very specific number (like f/1.7, f/2.8). The lens has also been constructed so that it can be easily attached to follow focus systems which are widely used by videographers. 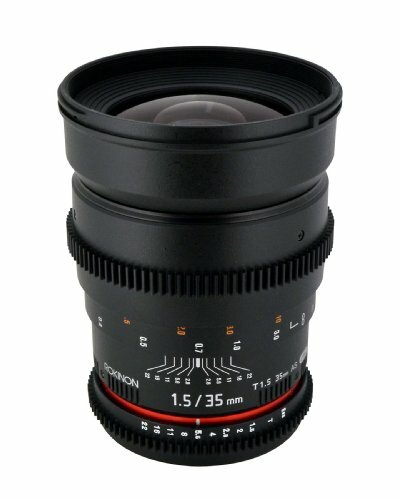 The Rokinon Cine lenses are the most affordable, high quality lenses in the market today. If you have any questions about this product by Rokinon, contact us by completing and submitting the form below. If you are looking for a specif part number, please include it with your message.